This past Christmas while we were all gathered ’round the dinner table staring in disbelief at the remains of our feast, Aunt Emily began to reminisce about her younger years. Aunt Emily is 96 years old, so those younger years were quite a while ago. While Aunt Emily claims that she has a lot of “happy memories” her strolls down memory lane often leave you searching for a pack of Zoloft or at least another drink. 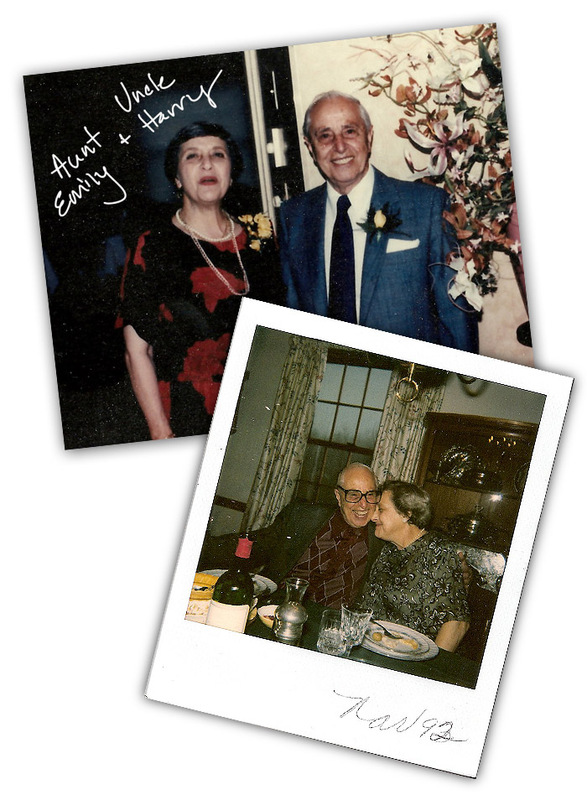 For those of you unfamiliar, Aunt Emily is The Box’s aunt – so a great aunt to John and me. She was married to my dad’s Uncle Harry. While they both had their fun-loving moments, their relative amounts of persnickety-ness combined to form a mightily cantankerous duo. They both boycotted Easter one year to protest a phone conversation with my dad that they disliked. They honestly believed this was a punishment for us. 1. She liked the old owner better and she misses him. 2. They don’t make her martinis properly (on one occasion the waiter brought her the gin and vermouth and told her to mix her own drink). These episodes usually leave John wanting to dive under the table from embarrassment, and I admit to staring forlornly at my dinner plate. However, even though Aunt Emily has strong opinions about food (and just about everything else), she isn’t a cook. Her self-admitted culinary claim to fame is being able to open a can of soup. Yet this past Christmas she began talking about the foods her mother used to make for her. Back when life was simpler. She mentioned something specific: Pane Cotto. I had never heard of it before, being more familiar with the cooked custard dessert Panna Cotta. She even gave me some loosey-goosey cooking instructions involving bread, lard, cheese and water. Fair point. However, in the interest of family history, kitchen experimentation, and just plain ol’ curiosity, I decided to look into it a bit. Heat up a large stock or cast iron pot. Add the olive oil and saute the onion, celery and kale until soft. About 10 minutes. Add the chicken broth and red pepper to the pot. Bring to boil and reduce to a simmer, let simmer for 10 minutes. Add salt and pepper as desired. Pour into a baking dish. Place your bread slices over the top, making sure they sop up the chicken broth mixture. 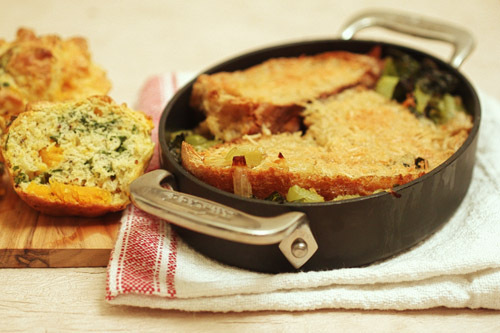 Cover the bread slices with grated Parmesan and bake for 20 minutes at 350 degrees. You want the tops of the bread with the cheese to get a little brown and toasty. It’s surprisingly good. 1 medium butternut squash, roasted, skin removed and cut into chunks. Heat your oven to 4ooF. 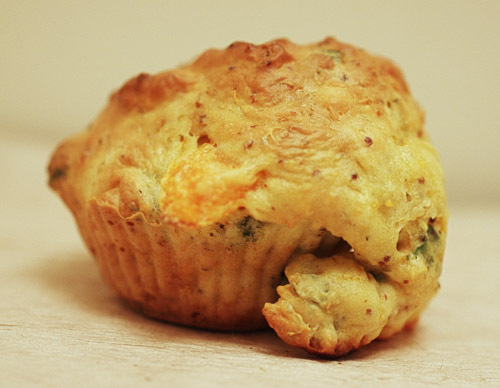 Grease a muffin tin well with oil or butter. 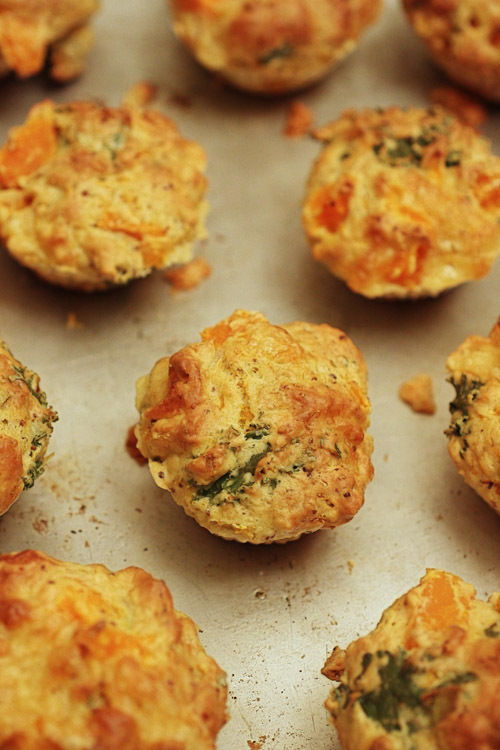 In a large mixing bowl, stir together about two-thirds of the squash, the kale and the semi-soft cheese. In a small bowl, beat together the milk, eggs, and mustard until well combined. Pour this into the bowl with the squash and kale. Sprinkle the flour, baking powder, and 1 tsp. salt onto the squash and wet ingredients mixture. Stir it all together until just combined. Spoon the batter into the prepared muffin pan. Sprinkle the tops with Parmesan cheese. 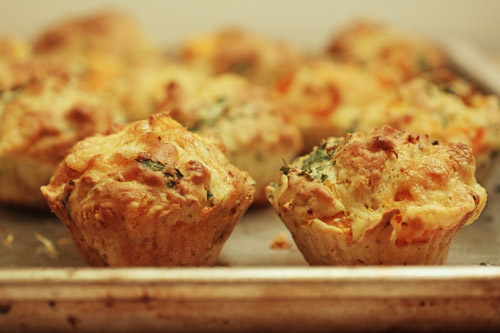 Bake for 20 minutes, until the muffins are golden and a toothpick inserted into one comes out clean. Remove from the oven, allow to cool for about 5 minutes, then dive in! You can also freeze these bad-boys for later use. This recipe was based on this version from Five and Spice. • Please note that Aunt Emily would probably hate both these recipes. 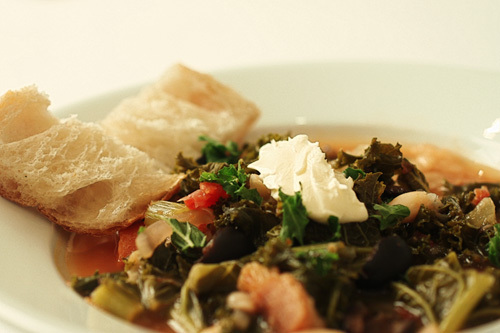 On our trip to Spasso, I became obsessed with their Ribollita soup. It was, in fact my favorite part of the meal (although John was a huge fan of the gnocchi). I don’t think I was ever more intrigued by a soup. 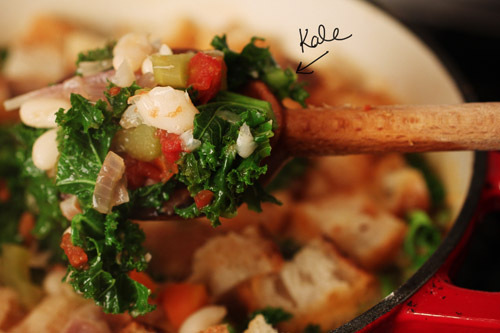 A simple blend of white beans, kale, melty shreds of parmesan cheese and the lightest of tomato broths with….what was that flavor in there?….PANCETTA! Seriously, people, it makes everything betta. Yeah, I said it. Naturally, I wanted to recreate this for myself in the Laboratorio Semi Moderno (my kitchen). Crusty, stale bread (like a baguette), cut into cubes and toasted. Kinda like croutons. Get out your most huuuuuge-mongous pot and heat the olive oil in the pot over medium heat. Then, If you’re using the pancetta (pleeeeease use the pancetta. Unless you’re a vegetarian. And then it’s OK not to), throw the meat into the pot, and let it toast in there for about 4 minutes (stirring). Add in the olive oil, celery, garlic, carrot, and onion. Cook these veggies slowly for 10 -15 minutes, but don’t allow them to turn brown. Stir in the tomatoes and cayenne pepper, and simmer for another 10 minutes, long enough for the tomatoes to thicken slightly. Stir in the kale, the beans, the 3 cups of chicken broth (you can use vegetable broth if you are keeping it vegetarian) and the water. Bring to a boil, reduce the heat, and simmer until the greens are tender, about 15 minutes. Cook 20 – 30 minutes, then stir in the salt, taste and add more if needed. Before serving, stir in a healthy amount of grated parmesan cheese and top with the toasted bread cubes (I like saying that better than “croutons”). You can even top with a dollop of ricotta cheese like they did at Spasso. I liked that very much, but if you read this blog you know how much I love ricotta. Why don’t you make some this weekend? Note: You can cool and refrigerate this soup, but if you do, please DON’T add the parm or the bread cubes until you’ve reheated it and are ready to serve. Makes a large pot of soup – enough for 10 servings.